Will Altria Group Raise Its Dividend in 2019? The tobacco giant has made some big strategic moves. Could they threaten its payout? Check out the latest Altria Group earnings call transcript. Few stocks have matched the dividend performance of tobacco giant Altria Group (NYSE:MO). For the past half-century, Altria has overcome huge obstacles to generate impressive returns for its investors, and although the shares have seen their price appreciate over that span, Altria's dividends have made the largest contribution to the stock's success over the long haul. Those returns haven't come without effort, though, and Altria has worked hard to navigate the changing climate in tobacco and related industries. The company has recently made some major moves that could dramatically change its business, including its decision to take substantial stakes in e-cigarette maker JUUL Labs and cannabis company Cronos Group (NASDAQ:CRON). With Altria having spent that much cash, some shareholders fear that the tobacco giant won't want to continue giving investors higher dividend payments. Below, we'll consider that question more closely. Data source: Yahoo! Finance. Last increase refers to ex-dividend date. *Takes into account adjustments for spinoffs. Altria made an unusual move with its dividend in 2018, giving shareholders not one but two separate increases. In the first quarter of the year, Altria made a modest increase of about 6%, taking the payout from $0.66 to $0.70 per share. Yet later, Altria made its more typical third-quarter dividend boost, with a big bump higher of 14% to push the quarterly dividend to $0.80 per share. One key reason for the double-move was tax reform. The massive cut in corporate tax rates gave Altria an unexpected profit boost, and in line with its past practice, the tobacco company shared part of that windfall with its shareholders through dividends. As a result, the total dividend increase of 21% for the year was extraordinary -- and not something that investors should count on happening again. Nevertheless, even with more typical once-annual increases, Altria has been good to dividend investors. Over the past decade, it's been common for Altria to deliver high single-digit percentage boosts to its quarterly payout. MO Dividend data by YCharts. Yet Altria isn't typically treated the same as other companies with similar dividend histories. That's mostly because Altria has broken itself up into multiple pieces on a couple of occasions. Having once incorporated the Kraft brand of food products under its corporate umbrella, Altria chose to spin off that business. Similarly, the spinoff of its international tobacco business into Philip Morris International (NYSE:PM) left the surviving Altria holding only the company's U.S. operations. Because of those spinoffs, the amount of Altria's dividend has occasionally gone down. But when you account for the fact that the size of Altria's business also shrank -- and that investors who held onto the spun-off shares of other business still ended up ahead on a total dividend basis -- it's fairer to treat Altria with the respect it's earned as a dividend powerhouse. Should Altria investors expect a dividend increase in 2019? It's an extremely interesting time for Altria right now. Facing U.S. Food and Drug Administration pressure, Altria chose to discontinue its own brands of e-cigarettes, instead spending $13 billion to buy a 35% stake in once-competitor JUUL Labs. At nearly the same time, Altria spent another $1.8 billion to take a 45% stake in marijuana stock Cronos Group. For some companies, making such large purchases would strain their ability to sustain dividends. But Altria's businesses remain cash cows. Over the past 12 months alone, Altria has brought in more than $7.3 billion in cash from operations. 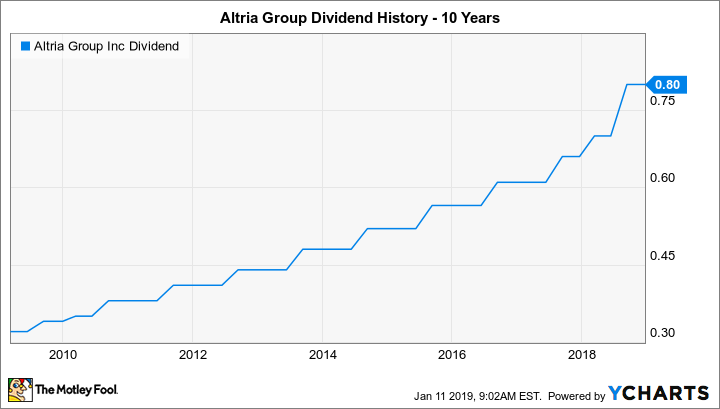 Even with its impressive 6.6% dividend yield, Altria spent just $5.2 billion making dividend payments over the same period. Altria said at the time of the purchases that it had arranged for a term loan facility to cover the purchase price. It reserved the right to arrange for permanent financing in the future, but it didn't give details on what form that might take. Altria's current debt load is reasonable, however, making it comfortable for the company to issue new bonds if it chooses without tapping into cash or diverting cash flow away from dividends. Investors expect Altria earnings to continue to rise at a healthy pace, and that should support the company's ability to deliver dividend increases at a steady rate. You shouldn't expect another 20% boost, but something like an increase to $0.85 per share would keep the dividend amount round and represent a solid 6% hike for shareholders.